I'm Here, Where Are You? 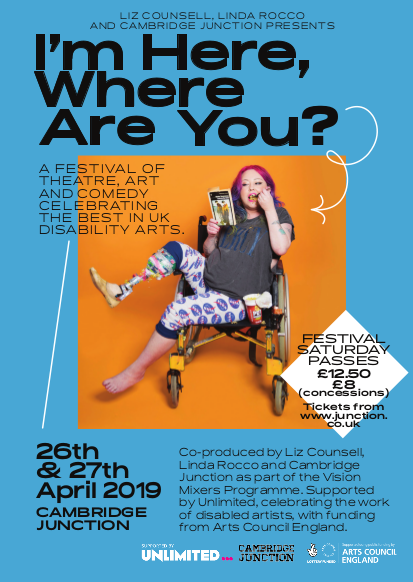 is a celebration of disability arts featuring nationally and internationally renowned acts. The two-day festival will showcase live performances, comedy, exhibitions, discussions and a podcast recording. Featuring work by Jackie Hagan, Owen Lowery, Vince Laws and many more! Produced by Liz Counsell & Linda Rocco. | Supported by Unlimited, celebrating the work of disabled artists, with funding from Arts Council England. Assistance will be available to help with guiding, opening doors, access refreshments e.t.c. - just ask a member of staff at any time or if you prefer you can discuss your requirements with the box office in advance. The Hub is a relaxed space throughout. BSL Interpreters are available to interpret works and for general communication. Captioning is available on selected events (please see individual listings for details). Audio Description is available for selected shows and the art installations (indicated on individual events pages). Please contact the box office to indicate you’d like a headset. All areas have step-free access. Accessible toilets are positioned throughout the building. Induction loops and infrared hearing assistance are set up in foyers and main performance spaces respectively. We can dog-sit registered working dogs if needed - please contact the box office at least 48 hours beforehand to request this.